Introduction: Advantages of laparoscopic surgery have been well demonstrated, though primarily through experiences in industrialized nations. However, there are few reports of laparoscopy performed in developing countries. Economic, logistic and technical factors have been cited as obstacles to performing laparoscopic surgery in underdeveloped nations. Methods: A surgical team consisting of general surgeons, gynecologic surgeons, anesthesiologists, senior surgical residents, and operating room support personnel was assembled. Surgical equipment and supplies were acquired through corporate donations and private purchases. Patients were evaluated by local physicians prior to our arrival, and those with surgical diagnoses were evaluated by our team. Operations were performed at a government sponsored hospital in Uspantan, a rural community in the highlands of Guatemala in July 2008. Results: 65 patients underwent 70 operations. 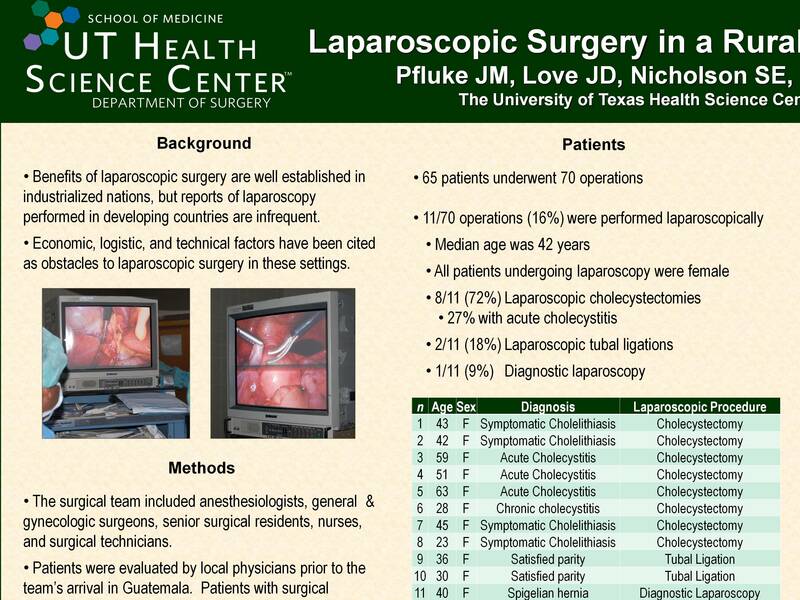 11/70 (15.7%) were performed laparoscopically, including 8 laparoscopic cholecystectomies, 2 laparoscopic tubal ligations, and 1 diagnostic laparoscopy. 2/8 (25%) cholecystectomies were converted to the open approach: 1 due to severe adhesions from a previously aborted open cholecystectomy, and 1 due to bleeding and equipment malfunction. No post-operative complications were identified prior to discharge from the hospital. Local physicians were contacted 3 months post-operatively, and no other complications were reported. Aging optical systems and insufflation devices represented the greatest challenges intra-operatively. Conclusions: Basic laparoscopic surgery can safely and successfully be performed in developing, resource-poor countries. Technical and economic obstacles exist, but can be overcome with careful patient selection and minor changes in operative technique.